While browsing through some recent comments posted on the Android market, I was surprised to read that some users complain that I am pushing too many updates. I usually work on these games in spurts, i.e. a lot of improvements in a short time followed by a period of relative quiet. Another problem is that the Android market does not enable me to push updates to specific platforms or builds only. So, for example, when I fix a bug for Android 1.1, some users will not see a change, but others may be happy to receive an update. Last, the Android market does not support a good way to show revision history. Updates are a pain? Really? its wonderful when developers continually work on their FREE app to improve it. Be thankful not frustrated. I always test new releases on emulators for Android 1.5 and higher (api 3 and up), for various screen sizes and other settings, as well as on the two actual Android devices that I have. However, I found out there was a bug on Android 1.1 (api 2), which I fixed in the latest releases of Chess, Checkers, and Reversi for Android. Users with an "older" phone that have never updated to more recent builds may have experienced problems (apologies for that!). The games should work again for all platforms. Needless to say, I added the Android 1.1 emulator to my mandatory release criteria. Since I just got some questions on the different levels in my Android games, I hope the following posting on this topic is helpful. 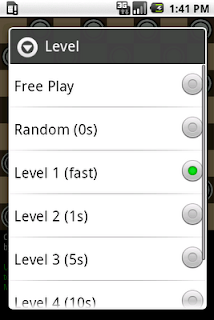 To change the level in either Chess, Checkers, or Reversi for Android, first press the Menu button on your phone, then pick the Level option, which gives you something that looks like the following screenshot. Then select any of these levels. Here, Free Play means that the game engine will never compute a reply. Instead, the phone can be used as a "magnetic board" to study games or play a game up to a position for further play with the engine. 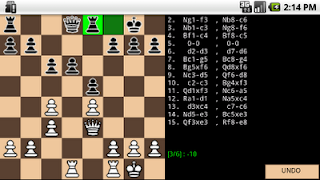 In Random, the engine will instantaneously pick a valid next move at random. Pick this level if you like to win! The next Level 1 through Level 5 select different normal playing levels, increasing in both strength as well as time taken by the engine to compute its next move. I just released a new version of Chess for Android that, like the previous updates of the other games, improves the text size on larger screens. On the Nexus One, for example, the notation window in previous versions was barely readable. This is now hopefully resolved for all current phones. Next planned updates consist of adding a small opening book and an option to export a game to some external format. 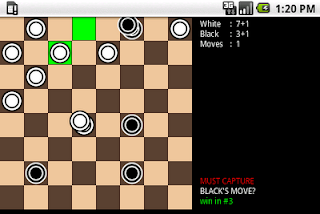 I just released new versions of Checkers and Reversi for Android that improve the text size on larger screens. 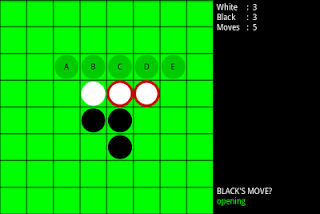 The reversi application now also uses a randomized opening for variety of play (see below). The latter feature is illustrated in the screenshot below. Please let me know if you encounter any issues with the new features.